After many years of searching, I think I finally duplicated my grandma’s old home recipe. My paternal grandparents, Albert and Marie Kleen, lived in Park Ridge, Illinois when I was a kid. Both came from German families. My grandma emigrated to the United States from Germany in the 1930s, and my grandpa’s family came here in the late 1890s. We called them ‘Opa’ and ‘Oma’, which is German for ‘grandpa’ and ‘grandma’. Like many of her generation, Oma often cooked at home, and preferred the food she grew up with. I remember dinners of schnitzel and spaetzle. One item that stands out in my mind, however, was beer soup. I’ve eaten beer cheese soup at restaurants, but none came close to what I remember. From what I recall, Oma used some kind of cheap beer, milk, sugar, and raisins. Definitely no cheese. The soup was white and frothy, and the raisins would swell up while being cooked. Woodbourne is a small hamlet in Sullivan County, New York, in the Catskill Mountains along the Neversink River. 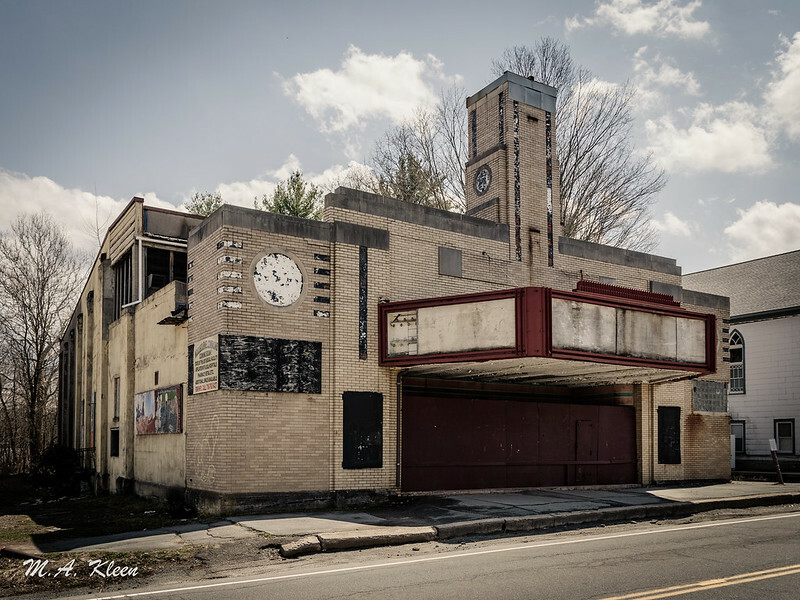 Designed by local architect Abraham H. Okun and Built in 1938, this Art Deco theater was added to the National Register of Historic Places in 2001. Also known as the Center Theatre or Peace Palace, it closed in the 1980s and has sat abandoned ever since. Oakwood Cemetery was designed by landscape architect Howard Daniels and opened in 1859. It is a secular Victorian “rural” or “garden” style cemetery where over 60,000 people are interred in 160 wooded acres. I have fond memories of Devil’s Lake near Baraboo in Sauk County, Wisconsin. My family vacationed there when I was a kid in the late ’80s, early ’90s. You could say it’s a family tradition. I’ve seen photos of my grandparents and great grandparents climbing the boulders. It’s a great spot for family vacationers looking for something more low key than nearby Wisconsin Dells. Formed millennia ago by a glacier that cut off part of the Wisconsin River, it was originally called Ta-wah-cun-chunk-dah by the Ho-Chunk, meaning “Sacred Lake”. According to legend, a Winnebago Indian fasted and prayed at the shore for twenty days, after which a water spirit called the Wock-cheth-thwe-dah (or Wakjexi) arose and told him he would live a long and happy life. Another Indian legend tells of a green water spirit with seven heads that demanded an annual sacrifice of a maiden. River Child spoke with a sturgeon, who told him the water spirit had a vulnerability. A well-aimed thrust behind its center head’s left eye would pierce its brain. On the day the maiden was to be sacrificed, River Child spread walnut husks in the water, causing the spirit distress and forcing it into his net. After a long struggle, he stabbed it in the left eye with his knife, killing it. River Child married the maiden and they started a village along the shore, but the ghostly screams of the water spirit arose with every storm, so they were forced to move away. Today, Devil’s Lake State Park is a popular destination for camping, swimming, boating, rock-climbing, and hiking. Whately Diner, at 372 State Road (just off I-91) in Whately, Massachusetts, is a 1958 Kullman model “princess style” diner, also known as the Fillin’ Station. It originally opened in Chicopee, MA as the Princess Diner, but moved by the F.L. Roberts Company in the early 1970s to its current location and called The Maverick. A scene from In Dreams (1999), starring Annette Benning and Robert Downey, Jr., was filmed there. Look for a new diner every Tuesday in 2019! Click to expand photos. This made-for-TV drama meanders through the opening salvos of the American Civil War. Written by Jonas McCord, directed by Gregory Hoblit, and produced by Steven Spielberg, Class of ’61 premiered on ABC in April 1993. This confusing drama follows members of the West Point class of 1861 and their families as they head off to join opposing sides of the war. It’s notable for an early appearance by Clive Owen, who is the only actor to stand out among the myriad of stock characters. As the film opens, three friends, Shelby Peyton (Dan Futterman), George Armstrong Custer (Josh Lucas), and Devin O’Neil (Clive Owen), are attending the United States Military Academy at West Point. Tensions are high as Confederate troops fire on Fort Sumter, leaving cadets with divided loyalties. Shelby Peyton, a Virginian, decides to resign and head south to join the Confederacy, despite his engagement to O’Neil’s sister, Shannon (Sophie Ward). Back home in Maryland, Devin O’Neil learns his brother Terry (Christien Anholt) has joined pro-Southern partisans, which upsets his pro-Union Irish family. Things get complicated when O’Neil is unable to secure a commission in the Union Army. He rooms with George Custer in Washington, DC, where he falls in love with Lily Magraw (Laura Linney), who also happens to be a Southern spy. Things get even more complicated when Shelby Peyton returns to his plantation, where his favorite slave, Lucius (Andre Braugher), has killed two slave catchers in an escape attempt. He is forced to flee northward in the Underground Railroad, leaving his pregnant wife behind to an uncertain future. Will destiny reunite all these characters at the First Battle of Bull Run? The series is creatively bankrupt. There’s an old saying that sums up how I feel about the Star Wars franchise. “Fool me once, shame on you. Fool me twice, shame on me.” After The Last Jedi, what more does the series have to offer? Anything the new films have to offer, we’ve already seen it done better in the original trilogy. When The Phantom Menace came out in 1999, the year before I graduated high school, my friends and I were in the theater on opening day. Boy, was that a disappointment. While maturity and the sheer awfulness of the prequel trilogy threw a wet blanket on my fandom, my hopes were raised when Disney took control of the franchise away from George Lucas. I watched The Force Awakens at a special screening while deployed to Iraq. It was… ok.